This is a combination of our top sellers Hot Sauces at MexGrocer that includes products imported from Mexico and the more authentic Mexican hot sauces manufactured in the USA. 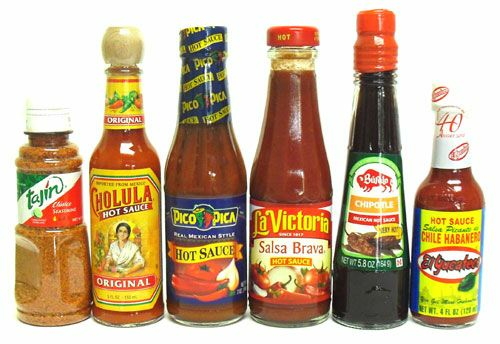 The package has one bottle of each product that includes: Pico Pica Hot Sauce 7 oz, Bufalo Chipotle Hot Sauce 5.8 oz, Cholula Hot Sauce 5 oz, La Victoria Salsa Brava Hot Sauce 8oz, El Yucateco Red Habanero Hot Sauce 4 oz and Tajin Snack Chile Seasoning 5 oz. Hemos seleccionado en este paquete �nico para esta temporada, las salsas picantes mas vendidas en MexGrocer.com que incluye, productos tanto hechos en M�xico, como las salsas mas conocidas y autenticas fabricadas en los Estados Unidos. Con el paquete ideal para regalo, o comprarlo para tenerlo en tu casa para compartirlo, podr�s darle gusto a toda la familia y amigos pues incluye: Una salsa Pico Pica, una salsa chipotle Bufalo, una salsa picante Cholula, una salsa roja de chile habanero El Yucateco, una salsa Brava La Victoria (muy picante) y un sazonador picante marca Tajin muy popular en M�xico por ser muy sabroso y para darle sabor a las frutas y verduras en tu comida Mexicana favorita. All items were excellent! I was testing out some new brands, and this pack does not disappoint! Wonderful Hot sauce gift pack. Amazing taste, and totally hot. This package should be bought by everyone liking good hot sauce. ProsTaste, flavor, and degree of spice or hot, is the bomb. You need to purchase this gift pack. You will not be disappointed. An excellent assortment of heat! Not a bad one in the bunch. This is a great selection of favorite sauces, each one used in a different dish. These are all great. Terrific variety of flavors. We live in Philadelphia and this is a great selection of many diffrent sauces, the price for any of these areound here (if i could even find them easily) is great! Great variety of Habanero, Chilpolte and traditional sauces, blended from the freshest imgredients.